Portraits drawn and painted by Longoria Middle School students in Edinburg CISD for the children of the Congo. Fourteen Edinburg Consolidated Independence School District students and their art teachers recently felt inspired after joining the Memory Project, a nationwide initiative in which art students create portraits for children and teens around the world who are living in orphanages or similar homes. Elizabeth Puentes, an art teacher at Longoria Middle School, brought the idea to her school after reading about the project in an art magazine. This past spring, Puentes and her fellow art teacher, Amanda Munoz, handpicked some of the students in their classes to be part of the project, which this year focused on the African children from the civil war-torn nation — the Democratic Republic of Congo. Organizers of the Memory Project said that children in orphanages usually have few personal keepsakes, so the purpose of the portraits is to provide them with meaningful mementos of their youth. The students received photos of the children, and then worked in their art classroom to create the portraits. of blue as the background. Meantime, seventh-grade student Cindy Fraire chose to draw a portrait of a girl named Stephanie, who was 13 years old. “I chose her, because I thought that I could connect with her, since she was my age and a girl,” Cindy said. The teachers hoped the project would inspire their students to showcase their art work in the community and beyond. The teachers said that was exactly what happened after they received a video at the start of this school year that showed staff from the Memory Project delivering their portraits to the children halfway around the world. In the video, the nonprofit organization thanked the students and staff of Longoria Middle School for their participation in the project and showed them how their art work helped to inspire children in the Congo when the organization delivered their portraits. Along with Puentes, several of her students cried as well after watching the video of the children receiving the portraits that they had painted. Cindy said that this whole experience has inspired her to think about a career as an artist. “Art makes people happy and I will enjoy it more,” she said. “So, to think that just one piece of paper made a huge difference in their lives is amazing,” Puentes said. Puentes and her students have already begun planning for another project in the spring, connecting with children in the Philippines. The Memory Project is a nonprofit organization headquartered in Middleton, Wisconsin. 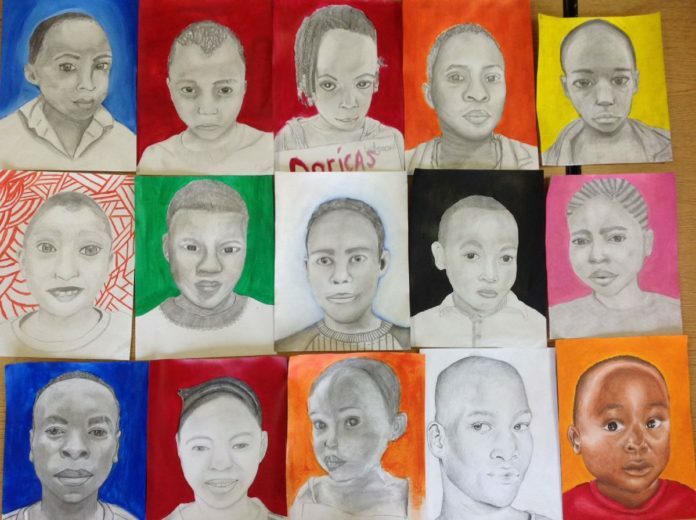 Since the project began in 2004, more than 100,000 American art students have created portraits for children in 45 countries.